If you have ever had a problem with moles, you will be aware just how difficult it is to control them. 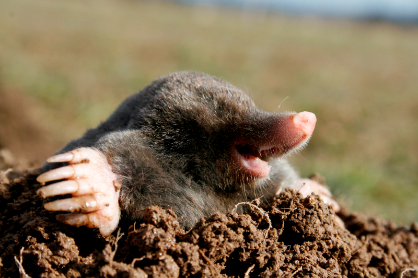 Moles cause damage to lawns and gardens by doing what comes naturally, tunnelling,which provides the Mole with its food source which literally drops into the excavations through the walls. Spoil from the tunnels is pushed out into heaps, causing heaps of trouble! More serious damage can be caused in agriculture where damage to grass cutting and other machinery introduces economic reasons for control. Problems with livestock, namely sheep (listeriosis), cattle (through contaminated silage) and horses make moles rather unwelcome to those who earn a living from the countryside. Mole activity also introduces risks to humans, affecting racecourses and gallops, pitches and playing fields, even airfields and flood defences. I offer a friendly Professional Mole Control service and cover The Amesbury, Andover, Tidworth, Marlborough, Stockbridge and Whitchurch areas. I’m a level 3 accredited member of the Guild of British Molecatchers, member of the Association of Professional Molecatchers and the British Traditional Molecatchers Register and only use traditional trapping methods. I work on a traditional NO MOLE NO FEE BASIS and do not charge for call outs and initial inspections. All work undertaken; Farms, Golf courses, Cricket pitches, Gardens, Sports pitches, Cemeteries, Church yards, Country Estates, Equestrian Centers. Tangley, Tidworth, Upavon, Vernham Dean, Whitchurch, and all areas in between.